The kitchen can be said to be the heart of the home, and the most used aspect by your family. It is where the family’s food is prepared and lessons on keeping a healthy family passed down to future caregivers. There is substantial time spent in this room. As such, the modern kitchen should be functional, comfortable and stylish. 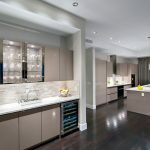 Here are different kitchen ideas that work for a functional modern kitchen. This is the favorite design the world over where space is at a premium. This design has all the elements of the kitchen on one wall, i.e. the stove, fridge and countertops are placed next to each other on one side of the kitchen. This kitchen has a working platform in the center of the room. This platform typically has cabinets underneath to make it more functional. The island adds versatility to the kitchen as it can be used to prepare food, serve and even sit on. This type of kitchen borrows heavily from the past when fireplaces were under chimney arches. The modern traditional kitchen has a strong aesthetic appeal and fits very well in large rooms. 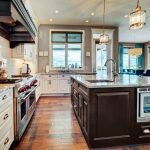 Wood and stone are featured heavily in this type of kitchen. This type of kitchen is factory made meaning that items like the fridge, cabinets and shelves are prefabricated before installation. This makes it very easy to put in place and maintain. Other ‘modules’ can be added later on as the need arises. Where space is available, this type of kitchen offers an added value of having the kitchen as a blend of a meeting/working place in the home where family members can spend time while preparing meals. Large kitchens allow for more styling and customization. This kitchen is installed where space is at a premium like a small apartment. Only the bare minimums are installed including the fridge, stove, washing sink and/or a hood fan. Items such as the microwave are stacked on larger items. This is a very common design where kitchen items are placed against two walls coming together at a right angle. This design is versatile as it can be used for different sized kitchens. This kitchen idea is also applicable when the utilization of space is a priority. It combines a dining area into the kitchen such that the family can socialize as the food is being prepared and have it hot direct from the stove. This design is also good at making use of available space. Items are placed against 3 walls. leaving a large working space in the center.